Take a flight from Mumbai at 06:45Am. Reach Mauritius at 11:15Am. Pickup from Airport. Transfer and check-in to your Hotel. The rest of the day is free at leisure for you to enjoy the beautiful island surroundings on your own. Enjoy dinner and an overnight stay at the Hotel. Enjoy breakfast at the Hotel and spend the rest of the day at leisure for last minute shopping and other activities of your choice. 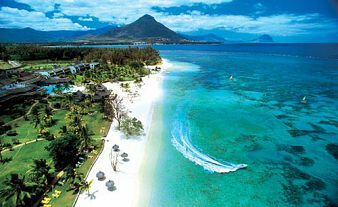 Check out at noon and transfer to the airport for your return journey home, full of wonderful memories from your trip to the gorgeous island of Mauritius. Drop at Mauritius airport. Take a flight from Mauritius at 09:20 Pm. Reach Mumbai at 05:00 Am. Take a flight from Mumbai at 10:35 Am. Reach Indore at 12:00 Pm. Free bies:- 1 fruit platter, 1 bottle of sparkling wine and seasonal flowers in the room upon arrival. One romantic dinner during stay. One 30 minutes massage for the bride and 15% discount on the first treatment for the groom during the stay.